The closer you get, the further ahead the finish line moves. I am talking about the impossibility of keeping up with the internet. Subscribe to a few more feeds. Spend a little more time reading the aggregators. Scan a few more tweets. And voila – almost current. 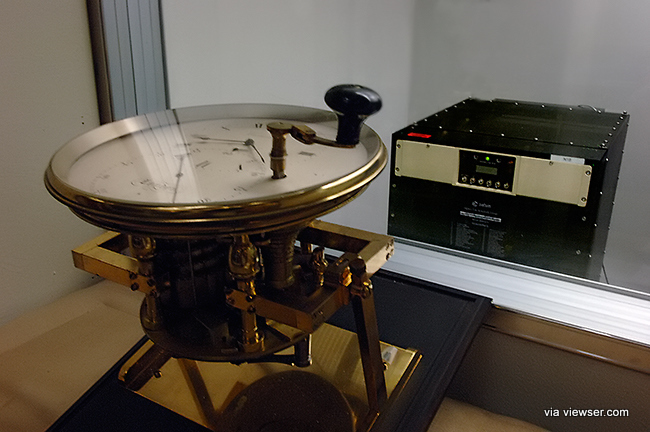 By the way – the picture above is of an old US Naval Observatory Official Timepiece – next to a box housing its newest – the atomic clock, from which is synched everything we interact with. The official way to tell how behind you really are. You and I know that in reality, the goal of keeping up with the web is impossible. The stuff on the web has already happened. If you read it – if you just got your tweet, or update, or text, or call, or alert- that stuff you are reading – well how fresh could it be? Someone had to type what you are reading. Even if it is new to you… it is old. You are simply are receiving a polite telegram or carrier pigeon note from where it happened. Only it is delivered electronically. A polite way of telling you, you weren’t there… but here is what you missed. Like the light we see from dying stars in the heavens every night. Beautiful. But old. Maybe even dead by now. I am not arguing that getting information before most people can’t be alchemized into currency. Financial institutions (via Flash Trading, server co-location and various high-frequency trading algorithms — some of which has now been rendered illegal ) have made billions out of trading a split second before the information gets made public. Current “Intelligence” around politics, business… even social relationships can be incredibly helpful and inform appropriate behaviors. Or inappropriate behaviors. And the gossip value of knowing when the new nano-fiber version of the latest Apple offering will appear holds some currency among some people. But the always-on stream you are getting inputs from is a past tense kind of thing. Unless, perhaps, you were viewsing a series of simultaneous, live, video streams of everything. I studied classical violin as a kid. Played it fairly seriously. Through the High School of Music and Art in NYC and college. But starting in the Brooklyn Borough-Wide Junior High School Orchestra… I was taught an important lesson by a great, patient conductor… a man by the name of Del Vecchio. The conductor’s downbeat actually precedes the orchestra’s playing by a split second. The players don’t wait to see it and then react. To be on time, everyone – players and conductor alike – needs to anticipate the moment… not just wait for it to happen. Google is trying to do that with contextual search. Actually suggesting before the query. But is that really such a good idea? Having the automated, algorithm powered, search amalgamator pump out its ideas (sponsored or otherwise) – suggestions that might have the effect of actually influencing actions right before they occur??? An advertiser or marketer would probably pay a bunch to be featured in that sweet spot. So really, in whose best interest will those options be presented. I prefer to opt out. I want to live through my experiences… not the collective experiences of the data warehouse. Actually thinking. Actually making conscious choices. And play my own music.